Every once in a while the most powerful shaping force in our country's political scheme, the Supreme Court, hands down a decision that sets a precedent and charts a course for the entire country. And by it's very nature, the court rules on what it believes is right or wrong. The court becomes the national moral conscience in many ways. Two things are clear about the Supreme Court. First, at the end of the day it is the most powerful political force within our balance of power structure. In other words, the court gets the last word. It doesn't matter what the law has said or how the people have voted, the court always holds the trump card if they feel compelled to play it. Second, the court sometimes reverses itself on issues over time, demonstrating its fallibility. The case with which the court is presently engaged is another potential "landmark" case in regards to religious liberty in our country. The owners of two for-profit businesses (Hobby Lobby Stores, Inc. and Conestoga Wood Specialties Corp) are suing the federal government over the birth control mandate that is part of the Affordable Care Act. The bottom line for these owners is they feel the government is forcing them to give up their religious liberty as business owners by requiring them to provide certain kinds of birth control they consider early forms of abortion (day after pill, etc.). The big question under consideration is this: Does a business have the same right to religious freedom as individuals? In 2010 the court ruled that corporations have the same freedom of speech guaranteed individuals in the First Amendment. But can a corporation have the same freedom to express religious conviction and operate according to those convictions? This is the BIG question. Pay attention to the term corporate personhood. When you hear it, this is what they are talking about. Hobby Lobby is basing their suit on federal legislation passed in 1993, called the Religious Freedom Restoration Act. This legislation provides that an individual's religious expression shouldn't be "substantially burdened" by law unless their is a "compelling government interest." The court must first decide if this law applies to a business and then decide if the provisions of the law are being violated by the Affordable Care Act in regards to these two specific corporations. A HUGE question to settle regards the constitutionality of the Affordable Care Act. Has Congress established a law that prohibits an individual's (in this case the business owners) free exercise of religion. If the supreme court rules in favor of the business owners, then certain aspects of the Affordable Care Act would seem to need to be revisited by lawmakers. If the court rules against the owners, then it would seem that where religious conviction and the abortion issue collide in regards to health care, a Christian owner of a larger business will have to concede his or her conscience on the matter if they want to be in compliance with the law. 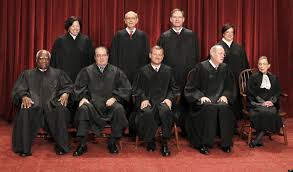 The Supreme Court, I believe, ultimately reflects the moral developments of the culture at large. Over time, the sentiments of majority tend to work their way into the legal arguments. And sometimes, these arguments get quite creative to justify the ruling. The Hobby Lobby case is a critical case our court is now deliberating. As a Christian I will pray for this decision and for the nine men and women who will make it. I hope you will too. The implications and further applications of the decision will be far reaching one way or the other. It is no understatement to say that we are a sports-crazed culture. Our conversations, passion, undying loyalties, travel plans, and much expense revolves around sports. There is big money in sports. From pee-wee leagues to the big leagues a lot of money changes hands every season. We will lose sleep, drive miles, spend too much, and become emotional wrecks over sports. But even though all this can be true, I'm still a big fan of sports. As a dad of two I finance, support, attend, and cheer. That good looking young man pictured here is my sixteen-year-old son who currently is playing basketball. Like most parents, I love seeing him and his team do well. As a pastor (and dad) I step back at times a soak in what I observe about my kids (and other's kids) and sports and try to think objectively about what I see that is good and what is bad. One thing is sure: our kids are learning from sports. The question is this: What are they learning? There is no doubt that kids can learn some positive things by participating in organized team sports. Here are just a few of the kind of things that come to my mind that they can learn from us - the grownups - if we teach them well. Kids are always enthused and motivated at the beginning of a season. However, you often see some discouragement set in as they are pushed to work hard, endure disappointment, deal with injury, become frustrated with their own performances, or ride the bench more than they think they should. A great life lesson that sports can teach our kids is that much of success is simply found in not quitting. And by sticking to the commitment kids learn perseverance - both its pain and reward. Kids who play sports will have to deal with winning and losing. They may play on a team that excels and demolishes the competition or be on the team that gets demolished game after game. Sports can help kids learn to handle winning and losing with grace. Sports is a great context in which to challenge kids to give their best effort and graciously accept the results. They have to learn that sometimes their best effort may not be as good as another's best effort on a given day. They can learn to accept this reality with grace and humility and resolve to work harder and improve. They have to learn that when they do win that they should receive the prize with humility, gratitude, and respect toward their defeated competition. learning to think "we" instead of "I"
When a kid is part of a team, he or she can learn tremendous lessons about teamwork. Some things in life are focused on individual achievement, but most of what we do is about cooperation and team. The team sports of childhood will be over in a blink of an eye, but the lessons of team will continue into family, jobs, careers, church and other organizations. As part of a sports team, kids learn to identify their own strengths and weaknesses and then learn how they can best serve the team. Sometimes your kid learns his best role is blocking for the guy who scores the touchdown, or making the pass to the guy who scores the basket. You can teach a kid to love his or her role. And if your kid is the one making the touchdowns or filling up the stat book, you can teach them to appreciate his teammates all the more and show it. Not everyone will be an all-star, but everyone can be a valuable part of a team. Some kids are just a little lazy by nature. Now, don't think I'm being mean here. We all know lazy adults (go ahead and think of one now). I'm guessing that person probably started out as lazy kid. Team sports can be a great means by which to push kids out of their physical comfort zone (within reason) so they can learn the benefits of hard work. By benefits, I don't mean necessarily winning the championship or becoming the MVP. They may simply learn that they can push themselves to getting better. A kid may not be naturally gifted to be the best, but he or she can always become better with hard work. This translates nicely into life when the challenges will just keep coming, but usually with so much more at stake. I want my kids to know the value in working hard, improving themselves, and rising to meet the challenges of life with the very best effort they can give. As a Christian parent I want to reinforce the biblical command in 1 Corinthians 10:31, "...whatever you do, do everything for God's glory." When the Bible teaches us to do everything we do for God's glory, I think "everything" means everything. This includes the games we play. My son gave his life to Christ when he was ten years old. As he grows in the Lord, I want him to see that all his opportunities in life, even in his sports, is primarily about giving glory to God. Therefore, the bottom line is how he conducts himself. It's about playing hard with a grateful heart to the One who gave you a strong body to play. It's about showing Christ-likeness to coaches, teammates and the opponents. It's about using influence to point others to Jesus. For a Christian, sports are not an ends unto themselves, but a means to be light and salt in the world while you're having fun playing and competing. Our kids who profess faith in Jesus can learn how to be a faithful disciple in sports now and allow it to transfer to all their future ventures in life. These are just a few positives that I think team sports can encourage in our kids, if we parents make these positives the focus. However, there is also the dark side of team sports (yes, like Star Wars). If we are not careful we can reinforce and essentially teach our kids some rather negative things through the games they play. One consequence of our sports mania is that we set kids, especially in high school, on a big stage. And the bigger the stage my kid is on the more I'm prone to project my own issues of self-worth and success onto him. We can teach our kids without ever saying it that they earn our favor through performance. When they play a good game, we praise, high five, affirm, hug and celebrate - all interpreted as acceptance and love. When they are struggling or just flat messing up, we yell criticisms disguised as encouragement during the game, and passionately critique and express frustration after the game - all interpreted as rejection and disfavor. If we are not very carefully, we will subtly teach our kids that our approval is directly related to their achievement, not their character. A famous coach said "winning isn't everything; it's the only thing." Pardon me, but that's just stupid. Sure, winning is enjoyable and the reward for being more talented and/or playing better than the other team on a given day. Who doesn't love to win? What parent doesn't want their kid's team to win? Nothing wrong with that. However, it is hardly the only thing, everything, or even close to the most important thing. If we teach our kids that winning is everything - an end unto itself - then we have now tempted them to use any means necessary to win. When you put all the emphasis on winning, you create a tempting situation. Sure, coaches and players may just work as hard as they can to win, which is good; however, we know other directions this obsession may lead. If winning is the goal, then I might easily justify playing dirty or talking "smack" to get in their head, using performance enhancing substances to get an advantage, or cheating just to make sure. If we teach our kids through sports that we can bend or break rules or act in questionable or unethical ways to improve our chances at winning, then we are setting them up nicely to apply the same mentality to relationships, jobs, and careers. One of the subtle lessons our kids learn from team sports is that somehow a person who can run faster, out muscle the other guy, put a ball through a hoop that is ten foot off the ground, or hit a small ball traveling at 80 MPH with a bat, has fundamentally more worth. Consider how much attention is given to athletes in high school. Ponder how much money is spent on and made through sports in high school. We even have the all important letterman jacket, primarily designed for athletes. (I know you can get the letter for other activities, but we all know those aren't as impressive!) Think about pep rallies and fundraisers and stadiums with artificial turf and trips and tournaments, etc., etc. Of course, this is nothing new. Athletes have always and still are exalted in society. And when this happens, then naturally our entertainment and money tends to flow toward the show. But just stop and think for a moment the message we are sending kids. The culture all around reinforces this all the time. I have to be conscientious to teach my kids that every person's self worth is found in the fact that he or she is a special creation of God and not based on any kind of performance or popularity. As a pastor, I suppose what most grieves me about sports is that many Christian parents have led and are leading their kids to make sports an idol. Now first here this: I'm not saying that occasionally a big tournament or a championship weekend or a once in a lifetime opportunity will present itself to your kid in regards to their team. These moments may take you away from your worship on the Lord's day at your church. However, what I mostly observe, particularly with basketball and baseball, is an absolute insane level of commitment to a game - more pronounced in the younger kids than the older! Weekend after weekend the family's schedule is crammed with games - mostly meaningless money-making tournaments here and there and everywhere. In addition to running the whole family ragged for ball, parents are teaching kids that sports always comes before God. During a season of play, the family is only in worship when there isn't a game to attend. And forget about the kids seeing mom and dad serving in the church in any meaningful way. There just isn't time because of the sports. Parents allow coaches to run their kids' lives, complaining often about how crazy it is, but rarely saying "enough is enough!" When our kids get older and church is not even on their radar, the blame will rest squarely on the shoulders of us parents who didn't teach them to honor God first and that the church should be essential to their lives. What we taught them, was to go to church occasionally when we didn't have a game, not to be invested in the work of the church, and that God only gets the half-hearted leftovers. When our kids become young adults and get really busy, they won't go to church at all. There are certainly many other positives and negatives. For the sake of brevity, these are the ones that mostly come to my mind. You can probably think of others. People have been inventing, playing and competing at sports since people first had the leisure time to do so. It seems instinctive to invent ways in which we can compete with each other - surely a subtle symptom of our sinful nature. Yet, a lot of good can be worked into our kids lives through sports, if we parents take the opportunity to lead, teach and encourage in the right ways. Sadly, the opposite is also true. We can regrettably reinforce some pretty negative stuff if we neglect, ignore or fail to encourage the right stuff. Either way our kids are learning from sports. The question is what are we leading them to learn.